Building out a stable pipeline of new leads as a consultant is always a PITA. It requires constant hustling and never-ending vigilance. And once you stop doing lead generation, it's only a matter of time before you suddenly find yourself in a situation where you're out of clients, and you have to seemingly start over again. We've all been there. And it's a frustrating situation. So what can you do? And more importantly, how can you avoid this, without wasting long hours every week on lead generation? You see, sending persuasive emails isn't just a winning strategy for course launches or e-commerce... it also works really well for consulting. Some people don't like sending cold emails, and that's totally fine. They aren't the best in all situations. However, implementing a simple consulting email sequence into your lead generation is definitely worth it! Today I'll reveal a neat 5-part sequence that generally works really well, and I've also used it personally to great effect. Let's dive in, with a specific example. Feel free to modify it to fit your own services. I recently stumbled across your website and I noticed that it’s not optimized for conversions. Because of this, you’re actually leaving a lot of money on the table. However, it’s quite easy to fix it. I’ve been helping aspiring entrepreneurs such as yourself generate more money with marketing automation for years and I’d like to help you upgrade your website. This would allow you to generate tons of new customers with predictability, every single month and massively grow your business. If so, would it be okay if I sent you a few ideas on how I could help? Let's analyze what this email does and why it works. First, it's relatively short. It gets to the point quickly and teases a clear benefit to the reader: generate new customers with predictability. If you did you homework right and you know your target audience, you should be able to identify a benefit that's definitely alluring to them. Focus on this but be careful not to talk too much about it. You don't want to overwhelm your reader right from the start... and for God's sake, please don't talk about yourself in the whole email! I'm sure your product must be really nice but why should I care about it? Why do you talk so much about features that I have no clue about? And why in the name of sweet Santa should I - as a busy business owner - do extra work to go to your site, read all sorts of stuff about things I'm not warmed up to be excited by, and flat out purchase it? Believe it or not, most of your own prospects will also react like this when you send them a pushy email that already asks for commitment but gives nothing in return. And then the sender goes on talking about another meaningless feature in a not-so-understandable way. It's obvious that this is a generic, canned template, that has a very little chance of converting anyone. Most people will simply ignore or delete it. 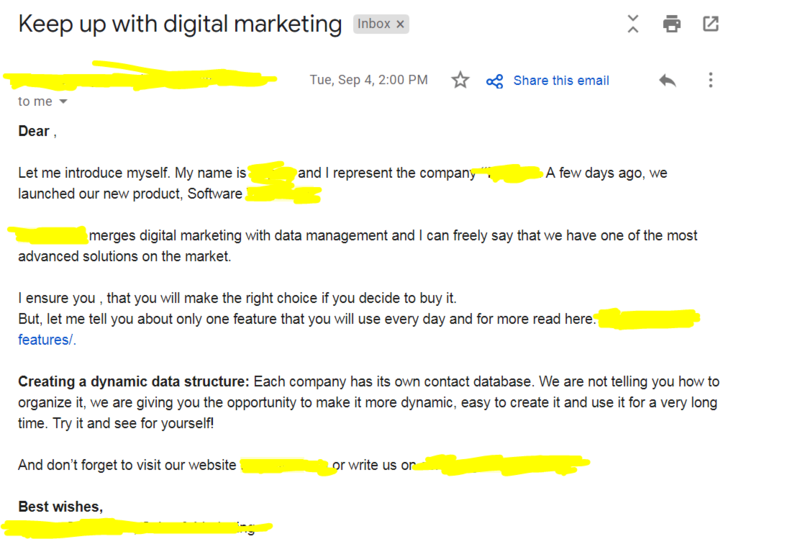 Don't send emails like these guys, seriously. You're better than this! Instead, make it about your reader, and frame everything from your prospect's point of view. EVERYTHING! BONUS POINT: Be careful with the call to action at this point: definitely ask them for a specific action, but don't be pushy because you're talking to a cold prospect. And because of that, there's still a high chance that they won't respond. This is completely normal: people are busy, many of them have hundreds of unopened messages, or your email just simply ends up in the spam folder. Use a service like MixMax to check if people opened your emails or not. Subject line: 2X your customers in 2 weeks? I recently stumbled across your website and I noticed that you’re losing a lot of leads because it isn’t optimized for conversions. You could easily fix this and get way more sales with a little bit of help. This would allow you to generate more valuable customers with predictability, pretty quickly. Notice how this email is very similar to Email #1. The content is basically the same, just re-stated in a shorter way. This is done intentionally because our aim is to get the attention of the prospect and get them to say a very easy 'YES', without extra work on their part. Remember, successful people are busy and there's a high chance that they simply missed your first email. It isn't personal, and chances are, they aren't purposefully ignoring you. So it's totally fine to re-send the same message, just phrased slightly differently. Also, notice how the subject line is different. This is done because it presents a different way of getting their attention, and to counter potential spam flags. All of these work in tandem to create a narrative flow, while still keeping things short. Also observe how the final question stays casual, non-pushy, and interesting. If your target market is reading this, there's a very high chance that they'll say 'YES'. And even IF they're flat out not interested, at least you get a hard no without wasting anyone's time, and without any 'weird' feelings. So let's say they reply. Great! But what do you do now? It’s always a pleasure to work with someone who’s open to new opportunities. Based on your current website, I’ve identified 3 fundamental elements that - when optimized - could fuel some serious growth in your business! This system allows you to always generate enough qualified leads without spending an arm and a leg, and convert those leads into paying (and repeat) customers (boosting your ROI). Listen, there are people who I simply cannot help, however, I see some real growth potential for your business. If you’re open to it, we can schedule a 30-min private strategy session where we can see whether I’m the best person to help you get the results you want or you need something else. This session is completely FREE, and in either case, you’ll receive some extremely valuable insights and personalized tips on how you can grow your business. This is basically the pitch email. We're still not selling anything that requires money. We're only selling the prospect on a FREE consultation call - which is essential in most consulting funnels. Even though this is technically free for the prospect, they still have to invest 30+ minutes of their time to talk to a stranger... so keep this in mind and respect it. The email starts out with some slight positive reinforcement but then gets to the point very quickly, offering 3 hyper-specific tips that my prospect should be interested in. Now, at this point, the reader already received value from my email, and even if we end up not working together, they can still use this information on their own - which is totally fine. In fact, that's exactly the point of this email: give value, while expecting nothing in return. This is in stark contrast to how many others do it (just look at the example bad email above), but prospects appreciate value-filled emails immensely. After presenting the 3 specific tips, I continued with describing the features and benefits of implementing these into the prospect's business. Mentioning the things that are actually important to the prospect: generating qualified leads without spending an arm and a leg, and converting them into customers! At this point, the prospect should DEFINITELY be interested. So it's time to go in for the close, right? This is a subtle, but very important mindset shift that gives you the upper hand. Also, notice how the end of the email isn't 'needy'. It doesn't have that 'please, please, please work with me' feeling to it. Instead, you're offering them a way to find out whether you can help them or not - and believe me when I say that people really appreciate this. There are so many sleazy salesmen out there, and people are sick and tired of them. Whenever they encounter someone who isn't pushy but actually CARES about them, it's like a breath of fresh air. This concept is essential in any successful sales conversation, and a pitch email is no different. And even if we're not a good fit, the prospect STILL receives awesome tips and value from the call - it's a win-win for them! But what happens if you don't get a response? Subject line: [NAME], Call me maybe? I just wanted to check in with you about working together to grow your business. Are you still looking for help with marketing automation and setting up the client-generating system? P.S. My schedule is currently pretty tight but I’m holding a spot for you for 2 days because you’ve shown some genuine interest before. As always, be prepared for inactivity on your prospect's part. Even if you send the best cold email ever, even if you hook them emotionally and they're totally interested in what you have to offer... they can still go silent. There are many reasons for this but you still shouldn't take it personally - chances are, your prospect is just living his or her own life, in a bubble of their own. If their stage of awareness is high, they'll probably be more receptive. However, if they don't fully realize the weight of their problems yet (and the value of your fix), they simply won't prioritize you over something else. This is totally 'normal', and a fact of life for consultants. Become comfortable with the fact that landing a new client is a gradual process, and it doesn't happen instantly. In fact, according to Salesforce, it takes between 6 to 8 interactions (or points of contact) to convert a cold lead into a paying customer. So don't worry if they don't all respond on time - this is a number's game. Regarding the email itself, it stays casual and it feels like a friendly reminder, not a demand. Be extra careful to avoid language that might seem passively aggressive, wounded, or needy. Even if you think it's disrespectful for them not to respond to you, keep it to yourself because unnecessary drama will only make the situation worse. Simply re-state the value proposition and the benefits, and try to convert them again. Introducing extra scarcity or FOMO (fear of missing out) can also help because it's great at dealing with indecisive people who are on the fence. Also, phrasing it like this positions you as someone who genuinely cares, and you're not just using a 'cheap' scarcity tactic - there IS a reason for why you're holding a spot for them: because they've shown interest before. Plus, including another call to action in the P.S. section is a good way of getting extra attention to it. At this point, you've done almost everything you could. If they come back to you, great. If not, there's still one last step before fully letting them go. I was looking forward to helping you fix the easily fixable, yet critical mistakes with your website, but I haven’t received a response from you so far. I’d hate to see you leave so much money on the table though, so I’ll leave this opportunity open for 12 more hours. After that, it’s gone. I’d love to help you become my next success story. This is the final email you send, hence its name, 'The Breakup'. 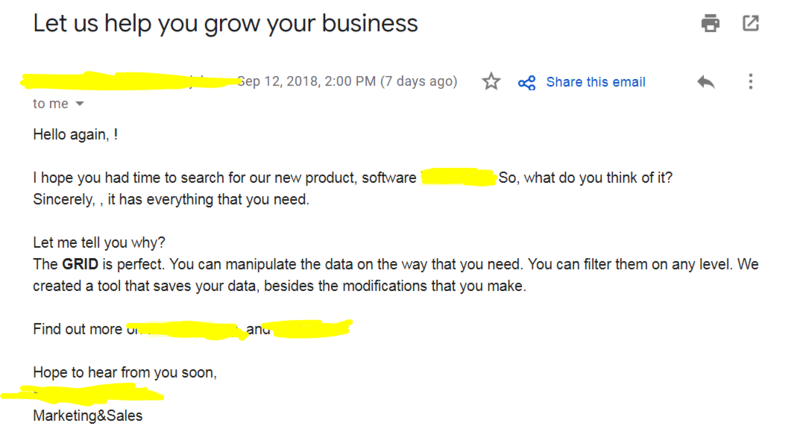 At this point, you've really done everything you could - chances are that they're probably not interested and they're going to ignore this email as well. But interestingly, this last-ditch effort often works surprisingly well at converting undecisive (or unattentive) prospects. Simple: because it uses several persuasive tactics to stimulate the fear of missing out, plus its tone is slightly different since you don't have anything to lose with it. First, it highlights critical mistakes that are costing the prospect money; then it agitates the pain of not making more (who doesn't want to 2-3X, right? ); and finally, it offers a solution to fix the problem. It also gives a warning that this offer is only available for 12 more hours - and the only reason it's still there is that we don't want to see the prospect lose any more money due to the problem. Finally, there's an additional call to action after the P.S., and that's it. It's your last ditch effort that I'd say works in about 20% of cases - so send it out with the mentality of letting this particular prospect go. If they still don't want to work with you, it's their loss, not yours. You move on. But what if someone comes back to you after 3 days, let's say? What do you do? It's a tricky question, and people disagree over the best course of action, but I recommend you don't work with them (unless maybe it's your absolute dream client or something). And that's because you'd intentionally degrade the value of your word and deadlines, lowering your credibility and losing respect in the eyes of the prospect. You're free to act however you'd like and every situation is different, however, I'd draw the line here. Building out a stable pipeline of new leads as a consultant can become challenging. So why not build a consulting email sequence that takes care of the hard work for you, with minimal effort on your part? You only have to set it up once and then it'll keep working for you in the background forever. Use this 5-part template to take the guesswork out of it, and have a solid sequence within an hour. Csaba Borzási is the founder of Game of Conversions. After spending 10 years learning the ins and outs of persuasion psychology, Csaba now focuses on what he loves most: helping ambitious entrepreneurs grow their online business and get more profitable customers. When he isn't geeking out on discovering how the human mind works, you can probably find him climbing a mountain, dancing salsa, or traveling around the globe. I help ambitious entrepreneurs grow their online business with conversion-focused marketing strategies.